The Trash Collective was born of Kelsey Ramage and Iain Griffiths wanting to change the status quo of the drinks industry's attitude towards food waste. Starting with Trash Tiki, the duo built an online platform and world tour demonstrating to bartenders that contemporary drinks didn't have to be wasteful, that simple techniques and equipment could be used to create delicious tiki cocktails, and that most importantly, none of this had to be dull and boring. Done in a series of bars across Asia to North and South America to Europe and Australia, they continue this mission to challenge the perception of food waste, now not only through Trash Tiki, but through a growing umbrella of platforms and ideas. 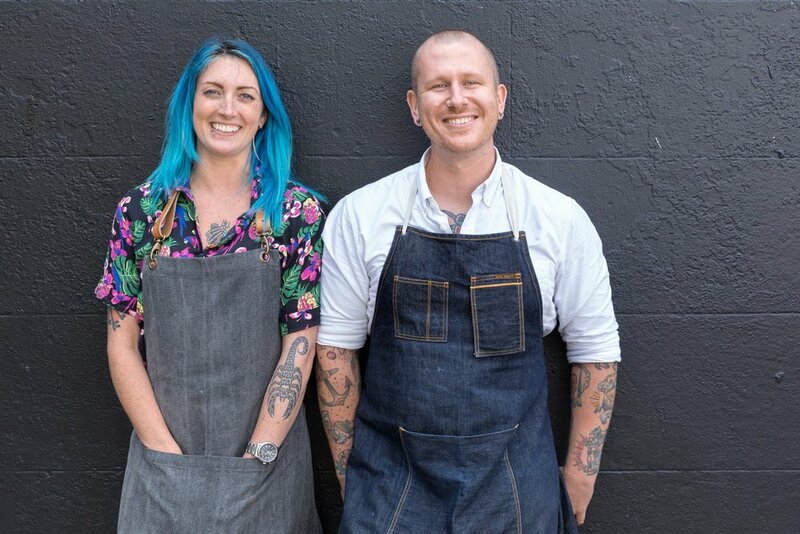 From late night disco parties with Wasteland Paradise, to Kelsey's own Common Sense Bartending that brings these simple techniques and overall anti waste lifestyle into the home cocktail environment, the duo believe everyone has a role to play in making the global issue of food waste a thing of the past. Born and raised in country Australia, Iain has worked in hospitality for over a decade in every aspect from high volume nightclubs, wine, fine dining restaurants and of course, cocktail bars. After spending time in bars such as Black Pearl and Eau de Vie in Australia, Iain made the move Edinburgh where he found himself running industry stalwart Bramble. During that time, the bar reach No. 10 in the Worlds 50 Best Bars, and Iain also have the chance to meet Ryan Chetiyawardana. Once moved to London, Iain was a creative co-founder of Mr Lyan Ltd where alongside Ryan and their other business partners, the pair lead the company to a string of success in the last 5 years. Opening the much lauded and highly innovative White Lyan, the company then went on to open Dandelyan (Best Bar in the World 2017, Spirited Awards, No. 2 in Worlds 50 Best Bars) and worked on numerous projects and events all aimed innovating and leading the industry to a better way of making drinks. In 2017, Iain reduced his role in the Lyan company, as Trash Tiki started to steamroll and become a full time operation. Setting off around the world with Kelsey after 5 years in the UK, the pair have now come to call Toronto home, using it as a base to continue travelling and highlighting the huge issues surrounding food waste. Originally from Vancouver, Canada, Kelsey holds 15 years of ongoing experience in the hospitality industry. Key to those years in Canada, was her many years at Vancouver institution The Oakwood, a casual fine dining restaurant that she was bartender, wine curator and ultimately general manager of. In 2015 she moved to London, starting at Dandelyan and making her way through the ranks to Head Bartender. On opening it won Best New International Cocktail bar” for 2015 at the Spirited Awards and moved 47 places to No. 3 in “World’s 50 Best”, in 2016 it took the title of “World’s Best Cocktail Menu”. In the 2017 Spirited Awards, it won "Best International Hotel Bar", "Best International Bar Team", and "World’s Best Bar". She went on to win the title of Global Champion for Olmeca Altos Tequila's Tahona Society Cocktail Competition in 2016 and continues to work with the brand speaking about sustainability and tequila around the world. At the end of 2016, the duo paired up to launch Trash Tiki, and set off around the world to bring their anti waste recipes and punk ethos to bars around the world. This year Kelsey has launched Common Sense Bartending, a contemporary lifestyle platform that looks at how everyone can reduce their environmental impact at home and in every day life.